Lucas Hnath’s A Doll’s House, Part 2, on paper, feels almost like a practical joke. 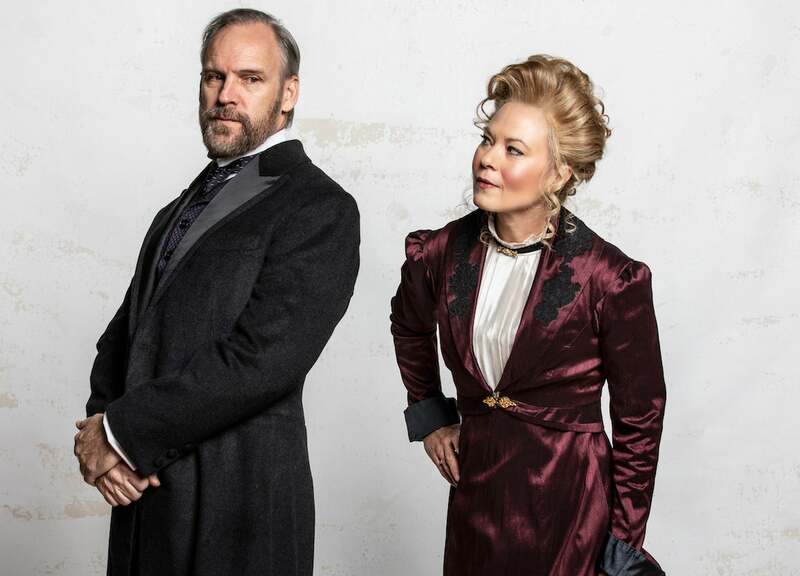 An audacious sequel to a 139-year-old play by Henrik Ibsen, updating classic characters with modern humor and the somewhat-occasional curse word doesn’t feel like a recipe for success. And yet, Hnath’s play will be the most-produced piece in professional American theatres this season. We got a first taste of why it’s such a delightful, subversive and understatedly profound show at our first rehearsal last week. 1.) This production is a full-circle Rep return for director Timothy Near. On the first day of rehearsal, you could tell that director Timothy Near and Rep artistic director Steven Woolf were excited to be back in the same room together. “We’ve known each other for 300 years,” Woolf joked. While their friendship might not span centuries, it’s been an essential part of The Rep’s history. Both of them directed their first Rep shows in 1981. After Woolf became The Rep’s artistic leader in 1986, Near became one of his go-to directors, leading productions of classics like The Glass Menagerie, All My Sons and The Little Foxes. Near says she still sees Woolf as a big brother, even though she’s technically the older of the two of them. So it’s fitting that she’s back to direct a show in Steve’s final season. Near says there will be a small visual tribute to her history at The Rep in the show – the set will feature a toy rocking horse, a prop that also featured prominently in her Rep directorial debut of Sam Shepard’s Buried Child. 2.) Now that Nora’s back, she’s dressing and acting impressively. Ibsen’s A Doll’s House ends with Nora Helmer choosing to walk out on her husband and children, punctuated by her resoundingly slamming the front door. Hnath’s Part 2 begins with Nora knocking on that same door, returning after 15 years to handle some unsettled business. In that time, she’s become a highly successful writer, which costume designer Victoria Livingston-Hall reflected in the clothes that Nora wears. Showing off a collage of historical outfits that inspired her designs, Livingston-Hall noted that some of the trends in 19th century women’s fashion were way ahead of their time, including shoulder pads and more masculine forms. 3.) The set was inspired by designer Scott C. Neale’s move out of his Maplewood home. In considering what has happened to the Helmer residence in the 15 years since its matriarch Nora left, he flashed back to what he felt when he and his family moved out of their home in Maplewood. Neale sees the Helmer residence as “a house, not a home” following Nora’s departure. So the set will be mostly monochromatic, reflecting the drab rut that Nora’s husband Torvald has fallen into since her departure. But Nora’s return at the start of the play will “bring a different element” back to the house, Neale said. 4.) The play’s language is brilliantly direct and cutting. All of those elements were on ample display in the first read-through. Hnath’s play defies the expectations of its source material and period trappings by having the characters speak with direct bluntness toward each other – there’s a hearty “F*** you, Nora!” early on in the play, for example. But at the same time, Part 2 continues to interrogate the same themes that fascinated Ibsen: of marriage, fidelity and gender roles. 5.) The cast is diving into the script with aplomb. Featuring a compact cast of four – Caralyn Kozlowski (Nora), Michael James Reed (Torvald), Tina Johnson (Anne Marie) and Andrea Abello (Emmy) – the play is all about the relationships between this core group. By comparison, the original Doll’s House had 11 characters. At the first read-through, The Rep’s quartet of performers were already getting big laughs from spectators while building the character relationships that will power the play.